Wealthy Affiliate Bootcamp Explained. I Made Over $200,000. Since mid 2013, I’ve promoted Wealthy Affiliate and was taught how to do it successfully by their Bootcamp course. Yes it’s true that I earned over $200,000. I will be showing some of my income reports from them for proof shortly, but I want to explain that these $200,000+ weren’t earned in a single month or year, they are the sum total of all the commissions I made promoting this program since mid 2013. So at the time of this report, it’s December, 2018 which marks the 64th month I’ve been promoting Wealthy Affiliate. Dividing $200,000 (it’s actually more like $240,000+) by 64 is equal to about $3,000+ a month earned. Now you may think this isn’t much, but you have to consider that when I started doing this, I wasn’t earning money from the first month, I climbed to reach it. For mid 2013, I made about $500. For 2014, I made about $40,000. For 2015, I made about $50,000. For 2016, I made about another $60,000. For 2017, I made about $40,000 (I got lazy). 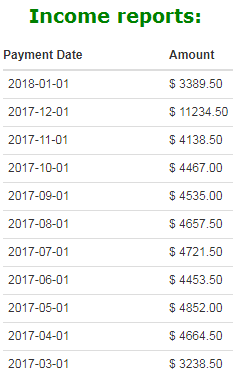 For this year, 2018, I am about at $50,000 again. There’s obviously some up and down earnings here, but a lot of it has to do with the fact that when I started experiencing good success from this project, that I got lazy and overtime, that laziness came back to haunt me. I stopped working on my business as much as I did originally to reach a good point and proportionally, my efforts were rewarded by less profits. I am certainly not making this mistake anymore and in 2018, I picked it back up, but I probably won’t see the fruits of that until 2019. 2 years ago, I also wrote this article within WA and showed additional stats of my earnings. The goal I have now is to double the yearly earnings and even triple them. 1) I know there’s many none members of Wealthy Affiliate who have heard about the Bootcamp course and want to learn more about it and if it works. I’ve already shown that it does, but I will be providing you a summary of each phase of the course so you know what to expect if you decide to join. 2) Bootcamp isn’t the only course inside Wealthy Affiliate, they also have another main one known as the Online Certification Course which I consider to be equally as important and I’ve had success with it too. I provided a link to the course outline above so you can learn more about it. There’s also sub courses there that teach different ways to earn an online online. 3) I provide my own personal coaching to anyone who joins WA from my page. Learn more here. Firstly, there’s many courses out there which offer their own Bootcamp training. For example, Click Funnels has one, but the one inside WA in my opinion offers an awesome opportunity for beginners to climb the online income ladder. 7 phases of training, 10 lessons each, equating to 70 lessons in total. Each lesson has a plethora of knowledge to offer and just as importantly, a list of tasks to complete (an action plan). You are given 10 lessons where you are told about the benefits of promoting WA (recurring commissions, long retention rate of referrals) and so on. Then you continue by creating a site which helps you promote WA. You learn about the various audiences you can promote this company to and for the most part, it is the audience within the make money online niche, which is often considered to be competitive, but I keep telling people, if you follow this training, it’s doable, for ANYONE. In any case, Phase 1 is an awesome step into the world of online marketing and promoting things as an affiliate. You learn about the traffic generating process, in this case, how to get leads which are interested in what WA has to offer, onto your site, through your link and into WA so they can become members and provide you with a recurring commission. You learn about keywords, reviewing products that are similar to WA but talking about the differences and overall benefits WA has to offer. Now at this stage, I have to pause explaining about Bootcamp and talk about the rumor in the online marketing community about how promoters of Wealthy Affiliate are talking trash about other companies to push their promotion of it. I have said again and again, that WA does NOT teach us to do this, and the people who go around practicing that are doing so off their own accord and should individually be held responsible. I detail that here. I’ve certainly been accused of writing bad/fake reviews to push WA, but I have in perhaps 1% of cases seen an actual, good, rational argument, the rest are just empty accusations that have no merit. Now I am also an evolving entrepreneur and what I mean by that is that some of the things I write and programs I review can be improved upon and I am doing that, but if a program is a scam, I will say it. If it’s not, I’ll label the pros and explain where there are faults. You learn about social media playing a part in expanding your business. Here I would honestly say the training could be improved upon. It could be that or perhaps I just didn’t follow it well enough, but you set up social media pages and learn to grow them and basically get more people to network with, to promote WA to. The good news is that when it comes to updates, WA is top notch in it’s tutorials and I’m sure an upgrade is coming to this section. You start to learn more about things like expanding into YouTube and other networks to build your site and name brand more so in other networks. I’ve followed some of the training and had decent results. Most of my success has come from implementing Phase 2’s training. You learn about the art of sales with existing people you bring into WA. You learn how to communicate with them, how to help them, how to get them to stay longer and pay you more in commissions over the long run. This is where I have to say that WA does a fantastic job is providing a nice system to talk to your referrals. For example, every time a referral of mine asks a question in the community, I get an email saying that they did this, and it gives me a chance to enter that thread and answer their question to keep them moving forward. This constant support and ability to communicate with referrals is great and it’s one of the ways I help coach people forward within WA. Learn more. You get into paid ads, specifically Bing Ads and promoting WA through this paid network. In other words, you set up ads, that appear on Bing and get clicks/traffic from it. I have to say that in my opinion, Bing Ads is truly a dark horse in the world of paid ads, because it’s so underused and not talked about enough, but truth be told, this network is a fantastic way to grow your online business and promote WA. I estimate that I made about $100,000 of my $200,000+ earnings from Bing Ads and I spent VERY little in the process of doing so because the training in this Phase is truly amazing and really helps you get the best scenario possible. In this current (last) phase, you are also involved with Bing Ads training, but here it is more specific on how to grow your profits from this network and lower costs at the same time. 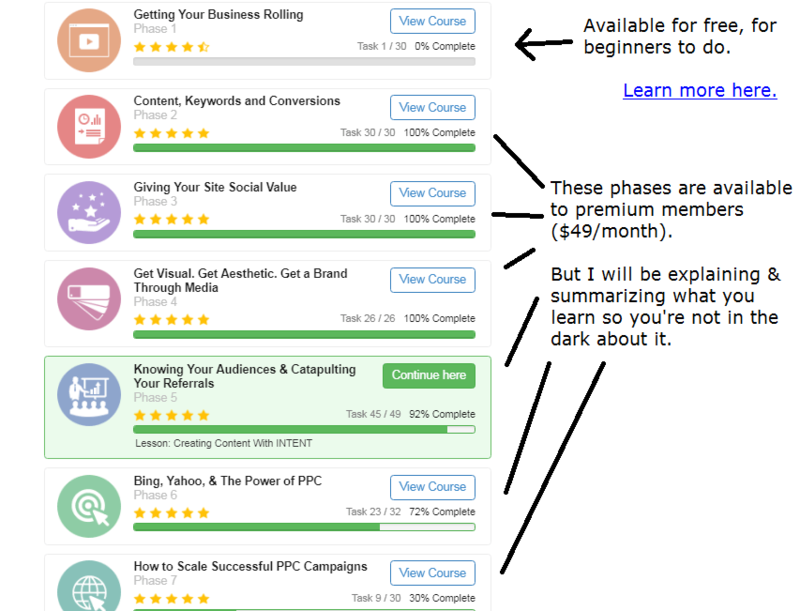 If Phase 6 training was the beginning of showing you how to succeed with Bing Ads, then Phase 7 is more for intermediate and advanced people on this subject to scale and grow from that. And that sums up the training. It may take awhile to get through all of it, but it’s exactly how I built up my site and it’s profits. WA is one of the most rewarding companies I’ve ever promoted. Actually, let’s be honest, it IS the most rewarding company I’ve ever promoted. One of the things they offer for their promoters is the ability to earn a trip to Vegas to meet the owners and I’ve done it 5 times straight so far. Get details on the WA Vegas incentive here. Does WA only teach me to promote it or can I make money another way? You can absolutely make money another way, by promoting something else. People often mistake the Bootcamp course inside this program as being the “only” course that there is, and this is 100% FALSE. As I said earlier, there is also the Online Certification Course you can go through which is very similar, but gives you the choice to promote something completely different. In fact, I have ALSO gone through that same course and have made multiple sites over the years which have made decent money (this was my best one). But again, the training is open ended here. And I neglected to mention that the $200,000 only came from promoting WA and doesn’t include the other earnings I’ve made through other sites and affiliate programs (see example). Overall, $1 million+ has been my result from following WA’s training. And that doesn’t take into account the other masses of training tutorials on local marketing, and other topics that this place has. Overall, you get way more than you can imagine in regards to training and it’s highly recommended. For starters, just do one course and commit to it. That’s how I suggest people get involved within Wealthy Affiliate to succeed with it. So when you begin, pick either the Online Certification Course or Bootcamp. The great news is that WA will help you pick which is better for you to start with. It is very encouraging to see a proof of income like this. As a person who is aspiring to get the same results, I’d like to know what separates you from others who have gone through the same training and yet did not get that result? What did you do that others (those who failed) did not do? You’d be surprised to know this Gomer, but the answer is, I did the training with an open mind. I worked hard on all the tasks that bootcamp told me to do and I was patient with my results (which came slow at first). Most people don’t have that patience and many also don’t want to work hard. It is really inspiring to read about your success here. And that you obviously expect to build on that. 1) Do you mind if I ask, did you start part time back then, or were you able to put in a full time work week with this? 2) Do you think someone who can only do about 15-20 hours a week can make significant gains with the bootcamp training? Your answer is important, because if it is yes, I will do the training all over again. Fortunately with Wealthy Affiliate a member has access to all the training all the time, so this available to me. 1) I don’t remember, I was a full time college student at the time, and I don’t recall the number of hours I put in, but it’s not about the hours, it’s about the quality. 2) Yes. But don’t only put your focus on the bootcamp training, only do it if you really love and want to promote Wealthy Affiliate. I list a number of success stories here, many of which did not promote WA, but used their training to build their other businesses, and they did the other course called the online entrepreneur certification course. Very good description of WA. I am also in the training courses but not bootcamp yet. Once I’ve finished the online certification course, then onto bootcamp I’ll go. I did take a quick look at it and can’t wait to start it. I’ve learned so much since I started at WA and can’t wait to start promoting it. It’s something I would recommend to anyone wanting to make money online. Dorothy my advice would be to invest the time into the existing course you’re taking there and to really put all your effort into that. Once you finish it, don’t just quit on the site you made through the course, keep building it, it may end up being it’s own success. There’s nothing wrong with going into bootcamp afterwards but I just don’t want you to neglect a potentially profitable online business you’re already growing just because you see people like myself are making money in another course. You could already be building a goldmine of a business, and that is why you should focus on that and only when you’re sure you’ve done enough on it, to move into bootcamp. Wow, you have made a lot of money. I always heard about these courses in WA but hearing about them from someone who has made a lot of money in a reasonable time frame is comforting. I know it will take time, but knowledge is the beginning of success. With that said the Wealthy Affiliate program looks like a good way to attain that knowledge. Looking forward to starting on my path to success! Hi Ron, the fact that you already acknowledge that it takes time is a huge step to success, believe me. I know when I see people talking about making money fast, that they are actually lessening their chances, because they aren’t willing to work hard. The fact that you are already makes me confident in knowing that you’ll get results with Wealthy Affiliate! Wow dude! So impressed with your earnings at Wealthy Affiliate. I know Wealthy affiliate is one of the greatest money making platforms, but It takes a lot of hard work and dedication to be at your status. One of my favorite features of Wealthy Affiliate is the training and their weekly webinars. I’d like to say to those people specifically newbies who are reading my comment here that Wealthy Affiliate is a real deal! They teach you how to make money and not just through an affiliate commission but other methods out there. Honestly I really appreciate your post on your earnings with Wealthy Affiliate. It takes a lot of good will for fellow members like you to be able to share this to encourage us. I am really motivated to do more in promoting wealthy affiliate now because I know I can also make it. I just joined recently and I will put more effort in the Bootcamp training to achieve a greater income like you. Thank you so much. You have always been my mentor ever since the first day I visited your site. The income you made in a month is far beyond what I have made in the past 6 months but I know with patience and hard work. I will surely get there. I think I will have to go back to the bootcamp training in order to gain more knowledge on what I am about to step in because that’s your recommendation. Hi I appreciate you considering me being your mentor, but I do not tell everyone to do bootcamp. I specifically tell people to also look into the certification course which I said is just as important. It’ll help people make blogs based on things they love. I love bootcamp and WA which is why I went this route. If you don’t have passion for this topic to, I would go with the certification course over bootcamp. Tons of good information that is well detailed and will be of good help to your readers, mostly for me because I’m so encouraged to work hard and to promote Wealthy Affiliate. I joined WA recently, and am currently in the midst of the certification course but have not yet started bootcamp. I appreciate you for sharing your earnings story about this platform. Thank you! Your current site doesn’t do that well. Or if it does well, let it get to a point where you can take time off to start a new site (a bootcamp one). And only if you have a passion to create a WA blog. Don’t start it just because of my success story, start it because you get results with your current site or develop a passion for the topic of making money online. Hi Hollie, a lack of writing for so long WILL cause that traffic slump to happen. I write a few times a week and that works out well, but ideally you should be blogging about topics that get targeted audiences to your website so you can make the most money from it. Read this blog post and it will help you narrow down what to blog about so you can do this. Thank you for your transparency! This is so relevant to me right now. I am currently developing a website promoting WA, however I have not even started the bootcamp training yet. I am still in the midst of the Certification course. I am so glad that you have recommended pursuing the bootcamp training first, so I will not go any further with this website until I start the bootcamp. Awesome that you have laid out an exact road map for going about the bootcamp training which is not far off for me. I shall follow you within WA if I get stuck and need you help. Such a timely and educative report, Vitaliy. Brilliantly done! All the very Best! Paul hello, I need to make an important point about what you said. I do NOT specifically tell people to go with the bootcamp course over the certification course. Rather it’s actually the opposite. Many people enter the online business world with an existing idea that has nothing to do with promoting WA or doing anything in the make money online niche and for those people, the certification course is HIGHLY recommended, so if you are currently in this course and using it for a niche business you love, stick to it. There’s many people who make the mistake of dropping a niche site they are passionate about and going into Bootcamp, but they aren’t passionate about that, so the results I have may not be the same for them. I love promoting WA and I know a lot about this stuff, so this is why this was the perfect choice for me. This is a great insight on how to make money by promoting Wealthy Affiliate. I took the other training on how to make my own website in the WA platform. I was very happy with the program WA offers because the website I made catapulted me to the 13th place in Google’s search engine and I’m very happy about it. Now you showed me the training which I have not taken yet about the promotion of WA. I think I should try my hand at it since you mentioned that it is possible to earn just by promoting WA. I will surely bookmark your website and if I have any problems, I hope you can offer me a helping hand. It took persistence and determination as shown on your yearly income stats. You are an inspiration for people who would truly earn online for a living. Francis hi, the beauty of WA is that their training shows different programs and ways to make money through your website. I take it you were talking about the certification course when you mentioned your website and that is actually a highly similar course to bootcamp and one I also recommend finishing. There’s many people inside WA who make a great living through their site by not promoting it. They just choose to promote something else and again, they will teach you this. $200,000? Wow!!! This is a dream I would love to reach. You did so well attain such success. I would keep to my training too, so, I can learn the process of being successful. Please, is the boot camp courses different from the other courses highlighted in the premium pack? The online certification course? They are pretty much the same Peter. I am not sure about other people but to me $3,000 a month sounds amazing. Some people who are doing hard labor earn less than that. I have a question, If I want to fully promote WA, do you think I should have another webpage dedicated to that? Or just my current site is good enough? I would like to give it a try but I am still new to the business and it gets overwhelming with learning new things. Well if your current site has something to do with making money, then promoting WA on that would be good, but if it’s on a subject completely different from that, then starting from a new site would be the best choice here. Got it thanks for the advice 🙂 Starting the bootcamp now as we speak. Thank you for providing this insightful review of the Wealthy affiliate bootcamp. I admit I was confused when I first started with Wealthy Affiliate and had to find out about the difference between the online certification course and the affiliate bootcamp. I have not even been able to go through the affiliate bootcamp because I kind of got stuck and stopped going through the certification one. I lost my job, which caused me to re-evaluate my finances and pull back from scaling forward. I wanted to get into e-commerce to find alternative sources for ad funding. On top of that, I already signed up for another large affiliate marketing program that offered large commissions. So my money was going to expenses pretty quickly and I needed to scale back and start working another part-time 9 to 5 to make ends meet. I appreciate you sharing your earnings story about this platform. It’s tough to measure how long it really takes to start earning because everyone is in a different part of their life when they start with this platform. Some have the capital to startup and dive right in right away. But others are starting with limited funds from a 9 to five job, so their process takes longer. What catapulted me into this online marketing sphere was ultimately losing my job again. It made me re-evaluate everything I’ve learned and whether it was worth it to stay in this field or not. I appreciate you showing me how to go about promoting Wealthy Affiliate in a better way. I am building out a strategy for my new blog that is focused on affiliate resources and making money online. My first blog was on health and fitness supplements for people in their 30’s. I kind of got burned out on it and it takes money to try a bunch of new products. I checked out your YouTube video and I am interested in some kind of mentoring or coaching. Thank you for the valuable content and I look forward to your future articles. Daniel hi, thank you for sharing all this stuff and with regards to coaching, I’m available in Wealthy Affiliate to speak to anyone. Normally, I always make sure my referrals get my attention first, but you’re more than welcome to send me a message inside the program and I’ll help you there. 1) If you want to promote WA, obviously do bootcamp, but commit to it. It seems like you may have been in a rush to replenish your investments because you said you were involved in other programs that cost a lot and often times, the money spent on those things, clouds our efforts to do the right things to build our business. So focus on one thing, within WA and commit to it. 2) If you have a niche topic you really enjoy blogging about, do the online certification course instead and commit ONLY to that. 3) You do NOT need to spend money on advertising with either bootcamp or the certification course. Both of them are designed to help you generate FREE traffic to your site. You can then use the earnings and do paid ads, but it will come from the profits of the site and you won’t really lose money. Hi Vitaliy! Thank you very much for this sneak peek into your earnings. This is a very down to earth post with all the facts laid on the table. I greatly appreciate all this information. There is a golden lesson I have learned from reading your post and it’s that hard works pays off over time. And that if we stop working in our business as we originally did, it will surely show overtime too. The point is that what we do this year will probably show a year ahead from now. Your experience is a huge motivation for us to work hard now and to be patient. Results will come! Absolutely Henry! What you said about working for the future is spot on. You can also see further stats of mine here where I talk about this site and how it did last year. 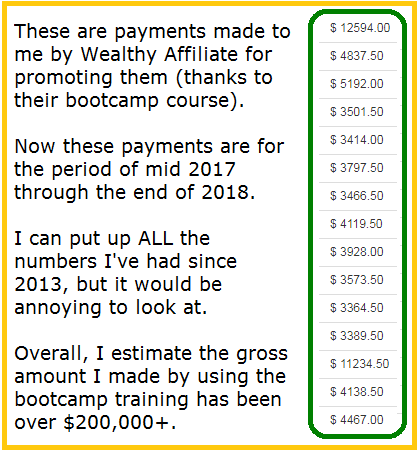 Thanks so much for the great review of what you can learn in the Wealthy Affiliate’s Bootcamp. I joined WA through you actually, and I am so glad that I found the review you did to get me here. I have gone through the online certification course, and have been very excited to do the bootcamp course also, but I have realized that it takes a bit of time to get your site up and running. I figured I would be spreading myself too thin if I tried to start another site at this time. I am amazed at the amount of information I have learned in the Online Certification course and am so glad that I have found this training program. I would never have been able to figure out how to get a website up and running without the training that I learned at Wealthy Affiliate. I have quite a bit more work to do to get to a point of earning a steady income, but it is coming slowly. I am excited to go through the bootcamp training at a later date, but at this point, I need to stay focused on my first site. Thanks so much for your information. It has gotten me on the path that I am hoping to be very successful in. Thank you for the inspiration, I am a member of Wealthy Affiliate and with such topics and lessons, I am assured of great success one day, though I have a bit of a snag with social media. I really can’t get the hang of it, but now knowing that it can bring great success, I think I could work on it, or perhaps you could give tips on how to go about it. Success with social media in this case rests on you showing people that you are a success story with your site. For example, if I started a social media page (which I did for my site, details here), I would constantly show case studies about me being successful in internet marketing and sharing that on social media to get people who are also interested in this to follow the page and come to me for advice. So the point is that you shouldn’t worry about social media until your site is successful, so i would do the training in WA and let that create the success. Thanks for providing this overview of the Wealthy Affiliate Boot camp. Your transparency with regards to your earnings is refreshing; and I appreciate your honesty with regards to the amount of effort required to see success. I’ve been in this industry for quite a while and everyone I know who has used WA boot camp only has good things to say! I understand they also offer a pretty good incentive for x amount of sign ups per year, an expenses covered trip to Vegas? Hi Nate, that is correct. I am actually doing that Vegas trip in a few weeks (5th year straight, see the details here), and I’m very much looking forward to it. The bosses at WA do indeed cover the flight, hotel and nights out, so it’s quite an experience. It’s how I got to know the owners so well and appreciate what they do and what they’ve created for people like myself. Hi Vitaliy, I have read your whole article and I have bookmarked your site first in my favorites section. You have shared a real experience. It would be better for me if I could join WA using your affiliate link but I already joined this as a premium member using another’s link. I’ve got great inspiration by reading your article and I will try to follow you. Thanks for this informative review. You are very welcome to get my help within WA. I offer it to everyone, but of course, I have to put my referrals first in answering their questions. Thank you for the very thorough review of Wealthy Affiliate. I appreciate you showing your earnings because there are so many “fly by night” people on the internet. I also appreciate you sharing actual screenshots and a video of the program and letting us know that there are multiple ways to earn income (with promoting Wealthy Affiliate or another interest). This is a great testimonial and review built in to one. I am a member of Wealthy Affiliate and its stories like yours that keep me going. I have no problem with putting in the effort and as much time as I can humanly free up because I know things will work in my favor. You truly are an inspiration and I hope you have the best year ever in 2019. As a member of Wealthy Affiliate, I send you my congratulations for your spectacular earnings. I also have to highlight the great work you do to reach the level of knowledge in which you find yourself. I aspire to follow your steps I am very close to finishing the bootcamp training course. I hope to start earning money next year with a very good promotion from me. Any questions, I will contact you. Thank you for this very detailed explanation on the Bootcamp. This is one of the few reviews I have seen where only the Bootcamp is explained. I think it’s important to highlight that the Bootcamp is not only for promoting Wealthy Affiliate, but really, for creating a website for any IM, MMO or Biz Op niche. These are very competitive niches, but I have seen many WA affiliates succeed (as you show here in your review). Very pleased to see your success with Bing Ads. I have tried Bing ads campaigns before but did not have much luck with conversions. A final question: Have you tried YouTube live and what has been your experience? Thanks again for your review. Enjoyed it. Hi Gustavo, thanks. I haven’t done any streaming on YouTube yet but if my subscriber base grows there, it’s certainly something I’ll consider (including other stream sites like Facebook live). I’m just more focused on scaling the existing results I have by just doing more of that. And great point on bootcamp applying to other MMO offers and promotions. I do promote other systems (not many), but when you hold them against WA, it ALWAYS wins on the number of benefits it has (for both referrals and myself). Great post! I am going through the certification training myself, and would not have even continued in this business without the phenomenal 24/7 training and support WA offers. Where the Bootcamp program is concerned, are you supposed to write an X number of posts or reviews within a given time frame? Hi Norman, there is no quota or time frame, you can do the bootcamp work at your own pace, but in the niches that are attached to bootcamp, you may want to blog more often. I wrote about this here. Cheers.